The Cabelas Guidewear Xtreme Parka is completely waterpoof and will keep you warm and dry in wet and windy conditions. With opening weekend for fishing right around the corner it looks like we might be seeing a lot of rain here in Wisconsin. No need to worry though, because thanks to the Cabela’s GORE-TEX® Guidewear® Xtreme Parka you will stay nice and dry all weekend long. 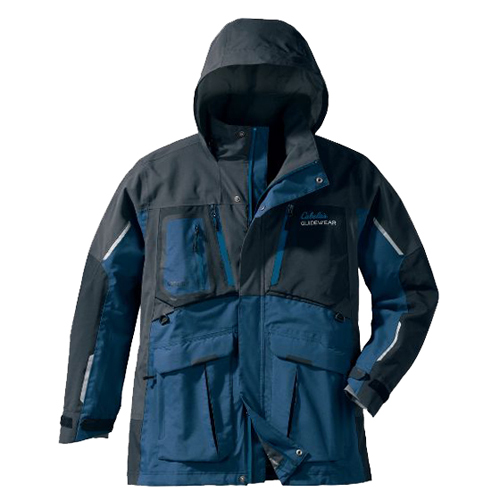 A good rain jacket is hard to find but the Xtreme Parka from Cabelas is a great buy for any fishing guru. The comfort of this jacket puts it at the top of the list when it comes to good fishing jackets. Offering GORE-TEX and 100% waterproof material ensures you of a durable product that won’t let you down. Even in windy conditions this jacket will protect you thanks to an adjustable chin guard and hood. It is also equipped with fleece lined pockets so your hands will stay nice and toasty throughout the day. The sleeves also have internal cuffs so you can be sure that rain will not slide down your arms. There are plenty of pockets on this jacket to store all of your essential gear and it also includes one interior pocket that is perfect for stashing a wallet or a cellphone. Sometimes jackets can be too constrictive and it just seems to be more of a burden than something that is supposed to help you., but the sleeves allow you to have full rage of motion that makes casting and moving around easy and comfortable. Cabela’s is known for making quality products and the Xtreme Parka is no exception. You can be sure that you will be bone dry this season, and many seasons to come with the Cabela’s GORE-TEX® Guidewear® Xtreme Parka. If the temperatures start to drop this jacket also make for a great outer shell and you can layer underneath it, which is perfect for crazy fall weather too. Good luck to all the fishermen (and women) this weekend and be sure to stay dry and have tight lines! If you need to find the Cabelas Guidewear Xtreme Parka, you can get it at Cabelas, or order it online here. Send us your fishing photos and let us know how you did on the opener or where you’re fishing this weekend.